Trees and plants have a kind of flexibility that is both disturbing and inspiring. Left to their own devices they can wrap around objects and create strange works of unintentional art. Properly pruned and cultivated they can be made into curious, compelling and useful shapes of all sorts. 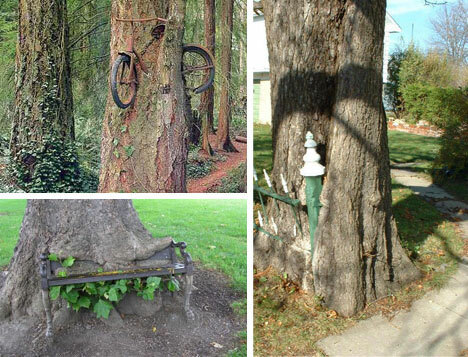 From tree furniture designs to unchecked acts of nature here are 25 examples of the amazing malleability of trees. 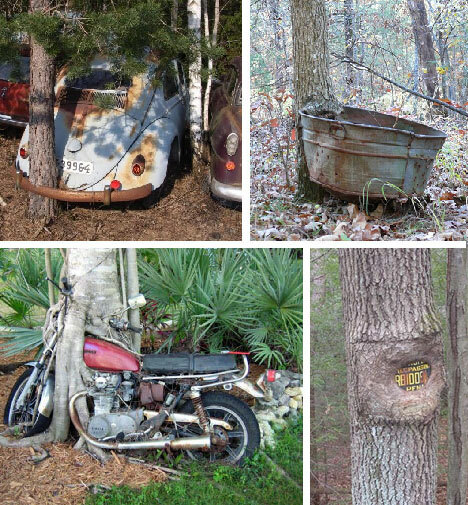 Of course, there are many forms of strange green art and other subversive ways to garden. Given time trees can grow around just about anything. Historically, there are a number of legends, rumors and hoaxes regarding man-and-cow-eating trees. Trees that consume people, animals or other objects have also featured prominently in various works of literary fiction such as Little Shop of Horrors. 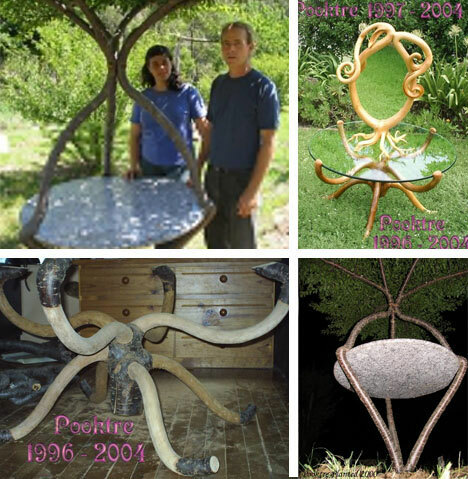 Peter (Pook) Cook and Becky Northey of Pooktre dot Com are two Australian artists and tree shapers who started their love of tree-shaping with a single chair tree. 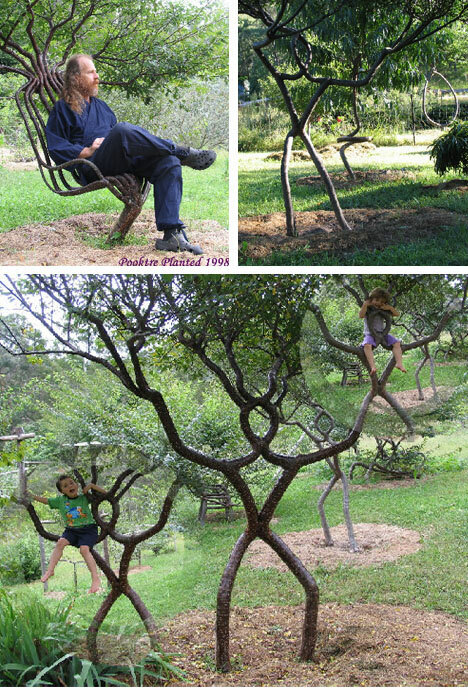 They have since created, individually and jointly, a vast array of tree sculptures, tables, mirrors and other growth-based tree shapes. 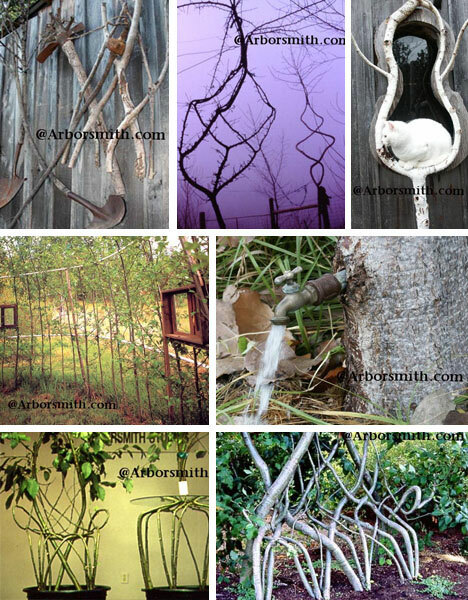 Richard Reams of Arborsmith dot Com focuses more on the artistic side of arbosculpture, creating some meaningful shapes (such as piece signs) as well as whimsically abstract pieces of tree sculpture. Some of his projects (such as grown fence enclosures and tree furniture) do, however, still serve a purpose. Chandelier Tree is a three hundred foot Redwood tree in California which had a hole carved into it nearly a century ago. 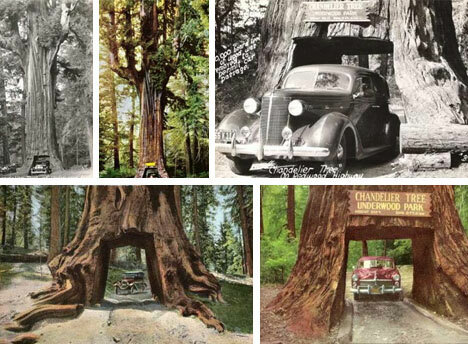 While such an intrusion on a magnificent tree would likely not be tolerated today at the time the novelty was considered worthwhile so that a car could pass right through a six foot hole at the base. 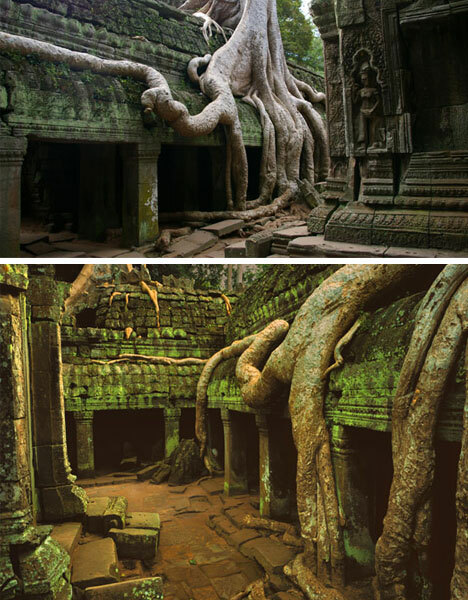 At many historic ruins trees have, over time, integrated themselves into the broken remnants of ancient structures. Of course this can be a problem structurally as the tree growth may compromise the stability of a building but aesthetically it is hard to deny the impressiveness of time as seen through trees. 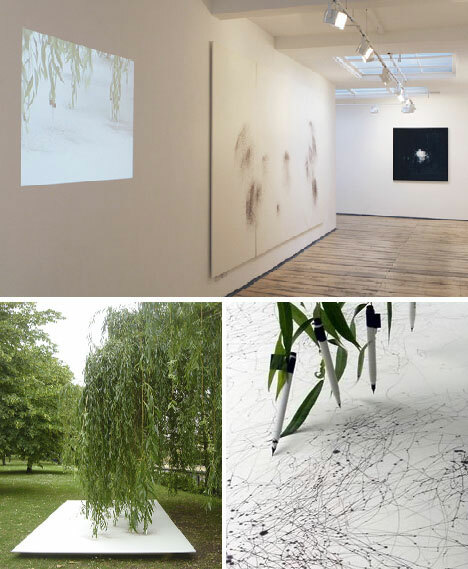 One artist has taken put together the idea of tree movement over time with a more immediate kind of art project by equipping a Weeping Willow tree with fifty pens and then watching the results. The natural shape and sway of this tree lends itself to particularly abstract results. As you can see in the lower right photograph above the results may not be high art but the patterns are at least interesting.